Note: This is the first of a series of photography tips that will be appearing weekly in Alphatracks. Watch for the a new tip each week. Practice this technique and you will know at a glance which Compact Flash cards are free to use and which need to be uploaded to your computer. Dec 5, 2008: If you are like me, you have a collection of memory cards. It’s great to have extra Compact Flash cards available, because you never know when an exciting photo situation may fall into your lap. If you have several cards on hand, however, it easy to loose track of which cards need to be transferred to more permanent storage and which can be erased and used for a new shoot. To be honest, I actually learned about this trick a long time ago, and I cannot remember who I heard it from. So while I can’t credit the original author of this tip, I can tell you it has become my standard operating procedure for handling memory cards. that holds six memory cards zipped inside. By carrying cards inside a case, all my cards stay together and are easy to find. I don’t have to search through my camera bag to locate the relatively small Compact Flash cards; all I have to do is locate the zipper case and select the card I want. Initially I simply stuck the cards face up in the case. Then I heard someone suggest that you could determine which cards were already filled, by inserting them face down in their storage pockets. Cards that are empty or which can be erased are inserted face up. It may sound fairly simplistic, but you would be surprised how much time and aggravation this can save. It is especially helpful when you have more of one card of the same brand and type. I recently got a great deal on three identical 4GB Compact Flash cards. I already had a couple cards of the same brand, which means that I now have five cards that look similar. Had I not adapted this trick, it would more than a little difficult figuring which cards needed to be uploaded and which were available for use. My procedure, which I adhere to without fail, is this. When I upload and backup my images from a CF card to my computer, the card is ready for reuse. I never erase or format the card on the computer, because I believe the camera is better at formatting a card for its own use. So when I determine a card can be reused, I simply insert it face up in any of the pockets inside the zipper case. 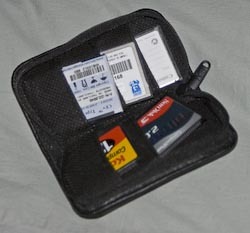 When I want to load a fresh card into one of my cameras, I can open the zipper case and select any card whose label is face up. As soon as the card is in the camera I either delete all images stored on it or format the card. This only takes a few seconds, and leaves the card empty and ready to store fresh images. When I fill a card, or swap it out for a fresh card, I place the used card face down in the case. By following this procedure, I can tell at a glance which cards are available for use. When I return to my computer, I remove all the face down cards and start uploading them with my card reader. When I am certain that all the images are backed up, I return the cards to the case face up and the process starts all over again. Did you or did you not archive the contents of that memory card? There are other benefits to this procedure beyond knowing instantly which cards can be reused. Recently, I had several assignments back to back. About the third day, I grabbed a card from the case and noticed that it contained images from day 1. For a few anxious moments I tried to recall if I had already uploaded the files from that card. I couldn’t remember. I thought I had, but I was not sure. Then it occurred to me the card had been face up in its pocket. Because I never deviate from the practice of only placing cards that can be safely erased face up in the case, I knew the pictures had been backed up. I went ahead and formatted the card, secure that the existing images had been backed up, even though I couldn’t remember doing it. Note that this only works if you are a fanatic about following this practice. I knew my files were backed up, because I never put a memory card face up into the zipper case unless it is free for reuse. One other advantage to this trick is it prevents you from leaving orphan files on your memory cards. Many times I have filled up a memory card with a hundred photos or more, then shot a handful of images on a second card. If you shoot a lot, it is easy to overlook the small collection of images stored on the additional card, especially if you are traveling or working on a tight deadline. Because my procedure is to remove all face down cards from the case and upload everything to my standard folder structure, nothing is overlooked. Even if there is a card with only 1 or 2 images on it, these images will be added to my library because I force myself to upload all the images from all the cards before putting them back in the case. How about you? Do you have a procedure that helps keep things straight when you are in the field? This entry was posted in DSLR, Memory Card, Photography. Bookmark the permalink. Post a comment or leave a trackback: Trackback URL. Your work-flow can be dangerous: if you insert a card face up instead of face down (errare humanum est), you might reformat it later by mistake and lose your work. I do store full cards face down and empty ones face up as well, but I reformat the card in the camera after I’ve downloaded it to the PC and have a second backup (or no second backup if conditions do not allow). I never erase a card. I always reformat, and always in camera (although it can end up being formated in one camera and used in another, given my work-flow). How many times can you erase and reuse a CF card? I have been having trouble with a card I have deleting images or corrupting images on occasion. I am curious if the CF card is just a bad card, or if I have simply erased and reused it too many times. Any suggestions?